A masculine Swiss man from Berne rocks a fur lapel and knee high leather boots with our Copper Orange Davek Elite Umbrella. I understand how pulling off Pascal’s look might be tough for most men, but I loved his boldness and how his look reminded me of the end of the Victorian era (ie Downton Abbey) when train travel was luxurious and people traveled with beautiful leather trunks. 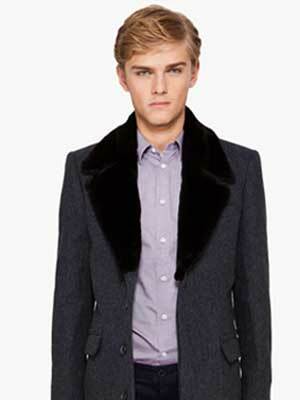 More importantly his thick fur lapel keeps him warmer without having to sacrifice the slim fit of his wool coat. 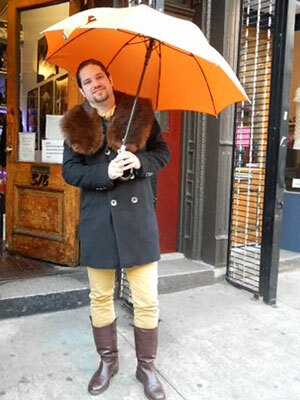 This entry was posted in Accessories, Umbrellas and tagged davek elite, fur collar, fur lapel, fur scarf, marc jacobs, men's fashion, men's knee high leather boots, orange umbrella, V, Victor & Rolf by Teresa no H. Bookmark the permalink.